Brit Decor : Home Page: Brit Decor: My top 5 kitchen styling picks! It's been one of those busy weeks filled with collaborative projects, which I love working on because it's a great way of meeting new people and topping up on inspiration - double hit! My focus today is turning to kitchen work surfaces and how to create a knockout scheme based around these. 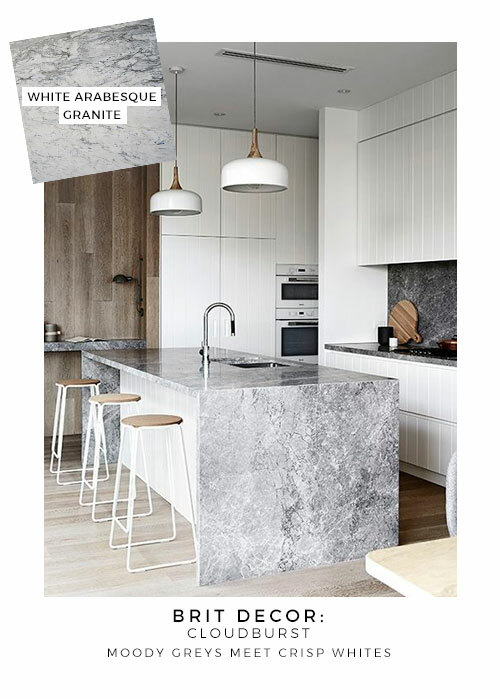 I've also drafted in the help of UK supplier Modern Worktops from where I have chosen all of todays granite & quartz materials, as examples of how to ace a kitchen scheme. I love the scheme 'above' which I put together under the theme of Cloudburst due to the moody greys and how these seamlessly fuse with crisp whites - like a collection of clouds. There's a touch of Scandinavian influence in here too with the pale wood tones. My inspiration was driven by Modern Worktop's White Arabesque Granite. My Purist scheme, immediately 'below' is for the minimalist seeking refuge from a hectic world. 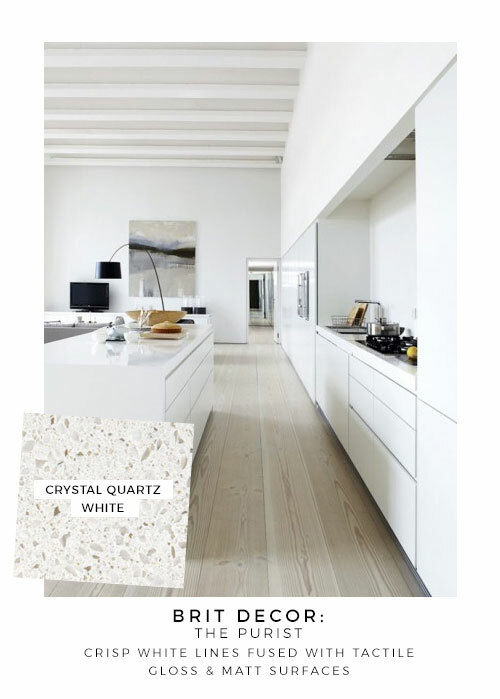 The clean white lines of the kitchen units are a perfect match for the chalky white and very subtle greys found in the Crystal Quartz White. In complete contrast to the previous scheme, I've upped the temperature with the Fire palette (also 'below). 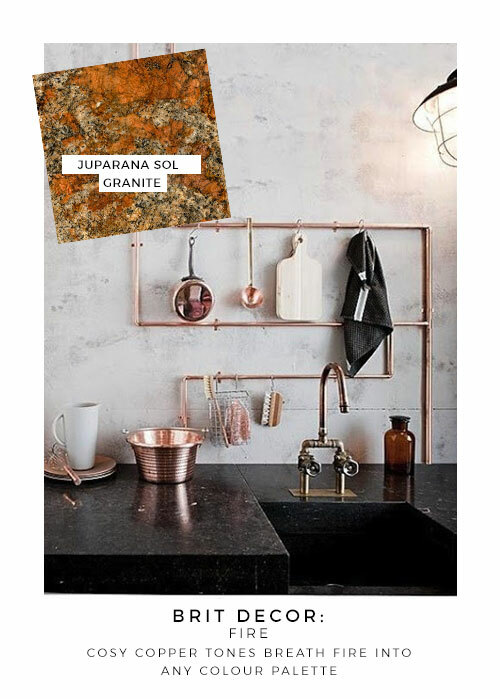 Indulging in rich copper tones inspired by Juparana Sol granite, this heartwarming material is crying out to be paired up with on-trend copper accessories, don't you think? Monochrome gets me every time! But why the twist 'below'? 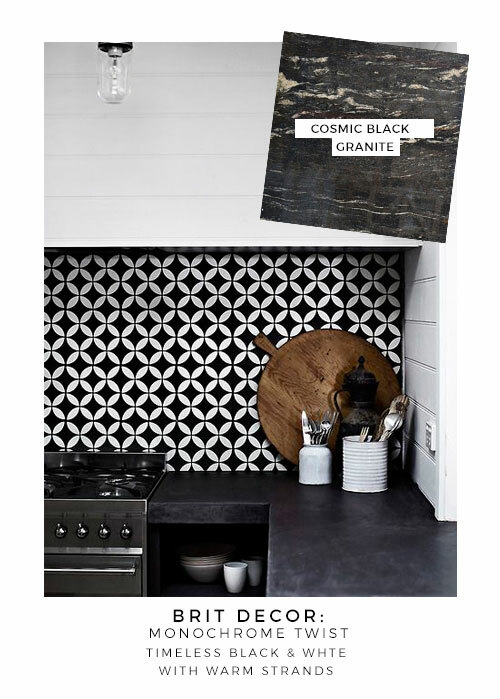 Blend in some warmer off-whites and we have Cosmic Black granite, which looks incredible when styled with warm rustic woods. 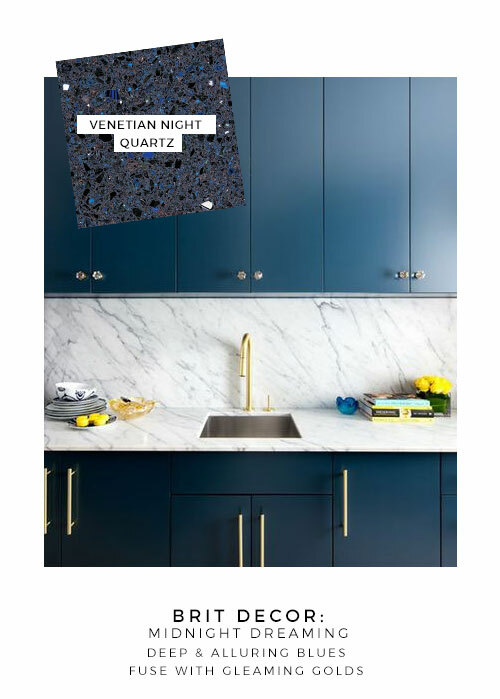 Finally we finish off with some deep and alluring blues styled against Venetian Night quartz, which I have fused with some glistening golds. Suddenly I find myself transported to a Summer's night in Venice!